What are the Top 5 Causes of Pedestrian Accidents? Los Angeles County is one of California’s most dangerous counties for pedestrians. Reducing the danger begins with knowing the top causes of pedestrian accidents. How Dangerous is Los Angeles County for Pedestrians? Out of California counties, Los Angeles County is the second most hazardous when measured by non-fatal pedestrian injuries. San Francisco County has the highest rate of pedestrian injuries and Alameda County has the third highest rate. For pedestrian fatalities, though, Los Angeles County ranks 13th out of the 28 California counties with more than 20 fatalities between 2007 and 2013. In that time period in LA County, traffic accidents killed 1,382 pedestrians and injured 35,653 more. Pedestrian accidents within the city of Los Angeles contribute to the county’s high ranking as a dangerous place for pedestrians. Pedestrian fatalities in LA increased 58% from March 2015 to March 2016. Long Beach is another city with increases in pedestrian accidents in recent years. Long Beach Police Department traffic statistics show that traffic collisions involving pedestrians increased more than 25% from 2011 to 2105. In 2015, traffic accidents injured 356 pedestrians in Long Beach and killed 13 pedestrians. Motor vehicles, walkers and joggers share California’s roadways. When collisions occur, pedestrians suffer more severe injuries and have a higher rate of death than automobile passengers. Understanding the main causes of pedestrian accidents is a significant step toward preventing accidents. Increasingly, smartphone use is a contributing factor in car crashes. Despite laws to prevent drivers from using cell phones, a Distracted Driving Behavior Study published in early 2017 shows that drivers use cell phones in 88% of their trips The study analyzed cell phone use by 3.1 million anonymous drivers over 570-million trips. California was ranked 7th for drivers least distracted by smartphones while driving. Drivers aren’t the only ones being distracted by cell phones. Pedestrians also use cell phones in ways that lead to injuries. Studies of emergency room visits indicate that pedestrian injuries related to cell phone use are on the rise. Drinking alcohol or using drugs before getting on the roads impairs judgment, slows reaction times, and interferes with coordination. These negative effects apply equally to vehicle drivers, bicycle riders and pedestrians. California pedestrian accident data from 2007-2013 shows that 35% of pedestrian fatalities involved alcohol use by either the vehicle driver or the pedestrian. Speeding cars are one of the biggest risks for pedestrians. The faster a car travels, the less time a driver has to perceive and react to changes in traffic. Also, higher car speeds lead to higher rates of pedestrian fatalities. Some studies show that a pedestrian hit by a car going 20 mph has a 10% likelihood of death. A car moving 40 mph raises the pedestrian’s chance of death to 80%. Drivers expect pedestrians at intersections and marked crosswalks. They don’t expect walkers and joggers to dart out from between cars or to be in the road mid-block. Pedestrians who disobey laws about where to cross streets are at high risk of being struck by a vehicle. 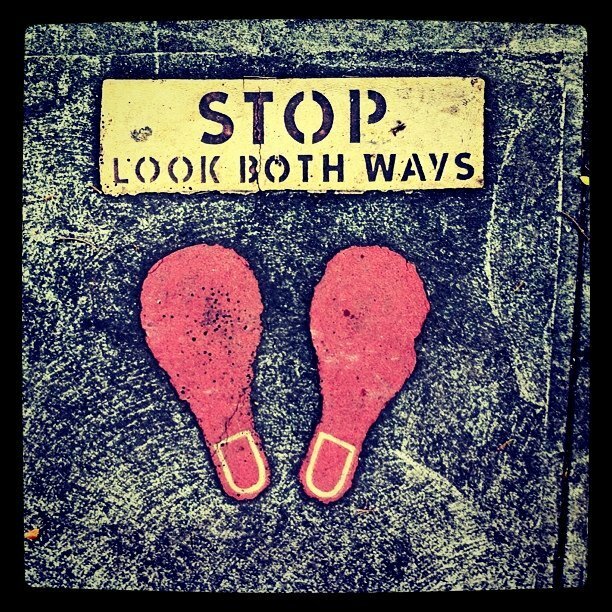 64% of California pedestrian accidents between 2007 and 2013 occurred outside of intersections. Pedestrians are harder to see at dusk or in the dark. Safety experts tell pedestrians to wear light-colored or reflective clothing at night. Putting reflective tape on clothing, shoes or backpacks and carrying a light are additional ways pedestrians can be more visible. What are the rules for pedestrians in California? The California vehicle code includes a chapter called “Pedestrians’ Rights and Duties,” which governs pedestrians’ use of roadways. California pedestrian laws are clear that both pedestrians and vehicle drivers are responsible for keeping pedestrians safe on the roads. “(b) This section does not relieve a pedestrian from the duty of using due care for his or her safety. Placing responsibility on both drivers and pedestrians fits well with California’s comparative negligence framework. Under California law, more than one person can be found at fault in an accident. Each person involved is assigned a percentage of the blame. Each person is then responsible for paying for that percentage of the resulting damages. If the jogger crosses in the middle of the block and a car hits her, she will be found at least partially at fault for the collision because she is violating the law. The percentage of fault assigned to the jogger will depend in part on the driver’s actions. If the driver was alert and driving slowly and just didn’t see the jogger dart out from between cars, the driver will likely be found minimally at fault. In contrast, if the driver was speeding, ran a red light, or was distracted and not watching the road, the driver will be assigned a greater percentage of fault. If a court finds the driver 20% responsible for the accident and the jogger 80%, the driver will only need to pay for 20% of the jogger’s damages. If the driver seeks recovery from the jogger for injuries, damage to the car or emotional distress, the jogger would be responsible for 80% of the driver’s damages. How can California’s streets be safer for pedestrians? California has many initiatives underway to make roadways more pedestrian and bike-friendly. Vision Zero Los Angeles is the city’s commitment to eliminate all traffic deaths by 2025. Vision Zero focuses on creating safer environments for pedestrians in the locations with the most pedestrian fatalities and serious injuries. Statewide, the California Office of Traffic Safety raises awareness about causes of pedestrian accidents during “California Pedestrian Safety Month.” A common theme of pedestrian accident prevention is that everyone is responsible for crash prevention. Drivers and pedestrians must remain alert and obey all traffic laws.